This is a zesty cream cheese, flavoured with fresh lemon peel. You can add as much sugar as you like, but we think the unknown ladies of our Cookbook may have liked it pretty sweet: they recommend serving it with candied oranges or a dab of currant jelly on the side. A qurt of good thick sweet creame. Put to it the juce of four lemons as as mutch peel as well give it an agreeable flavour. Sweeten it to your taste & add a littile peach or orange flower water if you like it. Whip it up as you would for sellabubs but very solid. If you have a tin vat, put a thin cloath in it & pour in your cream. If not, put it in a napkin and tye it pritty close. Hang it up to let the whey run from it. Make it the night be fore you use it. Garnish it with currant jelliy or candied oranges. If you search the web for the history of cream cheese, you’ll find plenty of articles claiming that it was invented by an American, William Lawrence of New York State, in the 1870s. Not so! 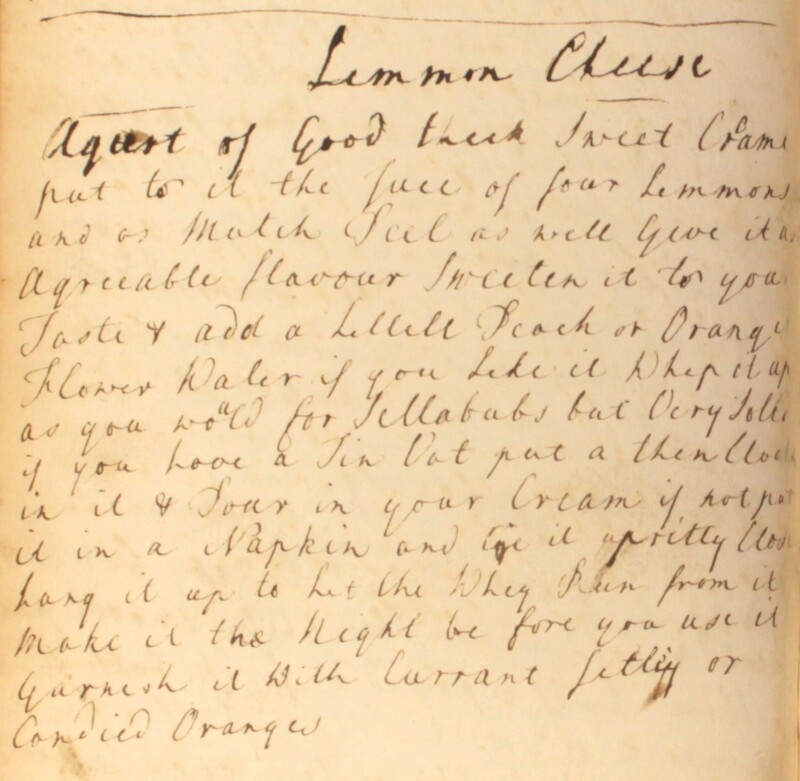 While Lawrence can lay claim to producing the first mass-marketed cream cheese, our Cookbook of Unknown Ladies proves that English ladies such as Mrs Ryve had long been preparing this dairy delight. Take a gallon of new milk & 3 pints of cream. Set ye cream on ye fire till it tis near boyling & power it to yr milk & 3 pints of scalding water. 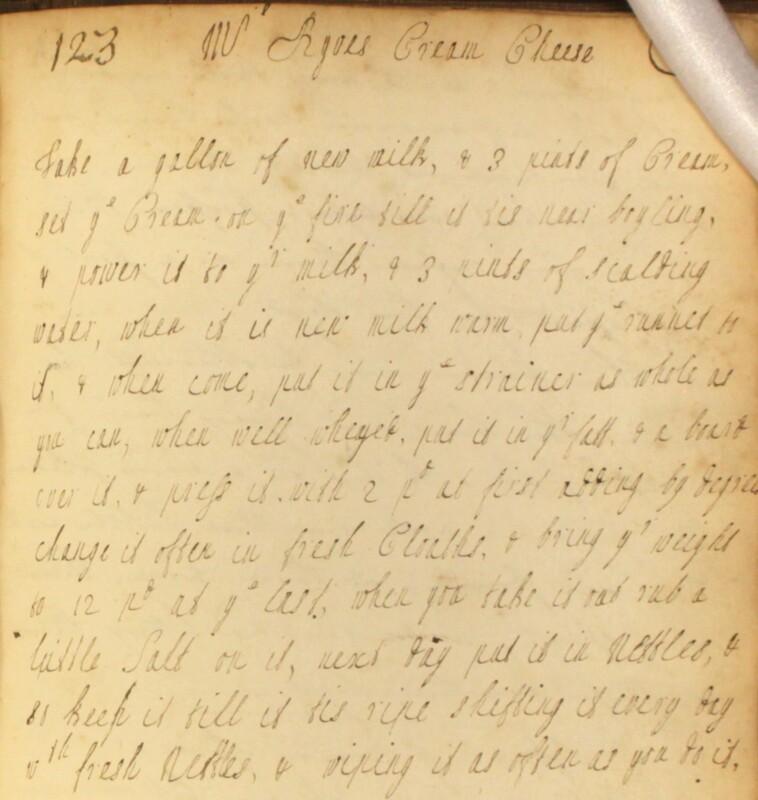 When it is new milk warm, put ye runnet to it & when come, put it in ye strainer as whole as you can. When well wheyed, put it in yr fatt & a board over it. Press it with 2 pd at first, adding by degrees. Change it often in fresh cloaths & bring yr weight to 12 pd at ye last. When you take it out, rub a little salt on it. Next day put it in nettles & so keep it till it tis ripe, shifting it every day wth fresh nettles & wiping it as often as you do it. Mrs Ryve’s recipe predates Lawrence’s mass-production by a century or so. The quantities here would have produced a pretty big batch, but it would have still been intended for domestic use. Her traditional method of cheesemaking requires a great deal of care and patience, but you can bet that the final result, when brought out from its protective covering of nettles, would be fresh, full of flavour and to hard beat!